Golden Horseshoe Bowling League (GHBL) is a Hamilton and outlying area ten pin bowling league for the gay, lesbian and transgender community and friends. I’ve been a part of GHBL for several years and joined their executive in 2014 as their liaison to all things web and social media. My role is to maintain the league website, create weekly mailchimp newsletters, help manage their social media page, and provide support for league members. 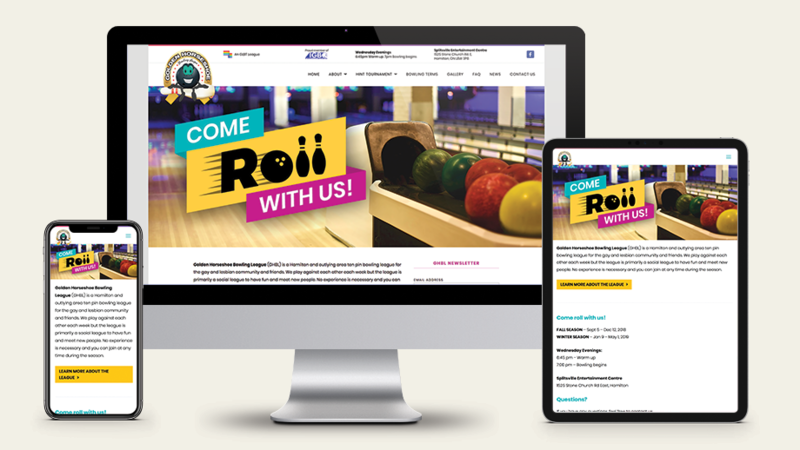 In 2018 I designed and launched a brand new website: ghbowling.ca. My goal was to give the league a stronger online presence by creating a design that is clean, modern, friendly, and cheerful. I also rewrote some of the content and restructured the sitemap, removing any redundant information.